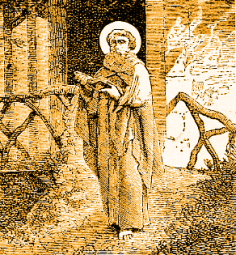 Saint Goar was born in the time of Childebert I, son of Clovis, of an illustrious family in Aquitaine. From his youth he was noted for his earnest piety, and having been raised by his bishop to sacred orders, he converted many sinners by the force of his example and the fervor of his preaching against all the contemporary disorders. But wishing to serve God entirely unknown to the world, he went into a region where he would be unidentified, and settling in the neighborhood of Trier in Germany, he built a small church and a hermitage, then retired into prayer. He came forth after a time and began preaching in the area to the pagans, who opened their eyes to the truth of the Gospel. Miracles seconded his teaching; he cured the sick and the lame by prayer and the sign of the cross. Saint Goar reached so eminent a sanctity as to be esteemed the oracle and miracle of the whole country. He practiced hospitality to the poor and to pilgrims, lodging them in his hermitage which he enlarged for that purpose; hospitality is the particular virtue for which he is and was then known. Nonetheless certain jealous persons calumniated him as a hypocrite, and the bishop of Trier sent for him. When he entered the episcopal palace, Saint Goar mistook a ray of sunshine for a coat hook and suspended his cloak upon it. The bishop took this for a sign he was a magician. He excused himself for the miracle he had not even noticed. He told his bishop that if sometimes he had served an early breakfast on the days when fasting was not obligatory, he had done so out of charity for his guests, not by intemperance. And he added that it was a great error to place all perfection in fasting and abstinence, since the greatest Saints have always recognized that charity is to be preferred. The King of Austrasia, Sigebert, learning of the sanctity of Saint Goar, wished to have him consecrated a bishop, and for that purpose summoned him to court. The Saint had already offered to do penance for seven years for a fault of the bishop of Trier which had become known. Saint Goar feared the responsibilities of the episcopal office and prayed that he might be excused, saying that his role was a different one. He was seized with a fever, from which he suffered as an invalid for seven years before he died in 575. A city in Germany is named for him, near Coblentz. Thou shalt love the Lord thy God with thy whole heart, and with thy whole soul, and with thy whole mind, and with thy whole strength.